Many think that all debt is bad and there is no good debt. Now let me just share you some thoughts on what I understood about the bad debt and the good debt. One might ask, is there any difference between the two? I believe yes there is difference. Almost all businessmen succeeded in their business through borrowing. The borrowed money is used to finance their business, but before they go to borrowing a feasibility study is being made in order to know the cash flow of their business. I can say that anything that will give you income after borrowing is a good debt. That means if you borrow money and then the money will be used as a capital and later will give you income then it is a good debt. As an example a certain entrepreneur borrowed money to buy for a Van which will be used on his school transportation business. He needs to pay 10,000 monthly in the company and he anticipated of having 15,000 monthly incomes for his business. A certain amount needs to be saved for the monthly maintenance say 2,000. With this given scenario a 3,000 monthly income is seen. Therefore this is what I call good debt. And so what is bad debt? Bad debt is borrowing for pleasure only. As example buying new mobile phones and using credit with zero interest. Even if it is zero interest, the phone needs to be paid monthly but there is no ROI (Return of investment). So if you really don’t need a new phone don’t use your credit card and wait for the time that you have an extra money to buy for yourself. However if this phone is a necessity for a business and you believe that your business can pay off the monthly bill then it is a good debt. Bad debt leads to headache and stress. For sure if one is into a bad debt it is impossible to save for emergency fund. 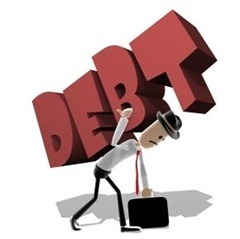 As a general rule when you borrow the money and it earns an interest then it good, if it is outgoing without any return of investment then it is bad debt.